Every year, Maikos/Geikos　(Geisha) belonging to a region called Gion Kobu have a one month long dance performance in April at their home hall, called Gion Kobu Kaburenjo. It is one of the most historical spring events in Kyoto, and this year will mark 142th Miyako Odori. It is an important event, which should appeal to many people including foreign travelers. It will definitely be among the best and realest Kyoto experiences for them. However, to enjoy this event fully, there is some basic information that should be understood beforehand. Miyako Odori is performed by 60 dancers. They are called Maikos or Geikos. In the simplest terms, Maiko is a training dancer, and Geiko is fully trained dancer. They are the experts of Kyoto’s traditional dance called Kyomai. And they practice everyday for their everyday work and special events like this. Maikos mainly perform this traditional dance, however, to be a real entertainer, they practice many different kinds of traditional skills, such as playing instruments, green tea ceremony, and even flower arrangement. Most people begin studying as Maikos after they graduate from junior high school or high school. Then 2 to 6 years later, they become Geikos and keep learning. They are not hostesses at bars, although they do serve alcohol beverages and sometimes play traditional games with their clients. However, generally speaking, it is difficult to see them. In order to avoid problems with new customers, most places where Maikos/Geikos work do not accept first timers. This includes Japanese people as well. Thus, this is one of few opportunities where ordinary people can see their performances at Miyako Odori. Kyoto currently has five different regions called Hanamachi, where Maikos/Geikos work. Gion Kobu, Gion Higashi (both in Gion), Miyakawamachi, Pontocho and Kamishichiken. They each use a different style of dance and manners and have pride in being different from each other. Each region has their own annual performance. And Miyako Odori, which stared as a ceremony for an expo in 1872, is peformed by the Gion Kobu region. 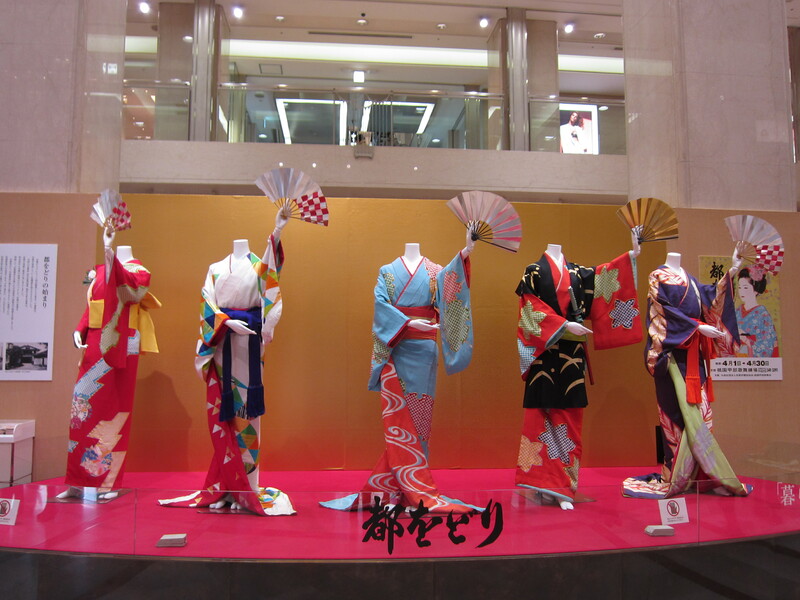 Miyako Odori is an hour long performance, which starts at 12:30, 14:00, 15:30 and 16:50. It consists of 8 different sections which describe Kyoto’s beautiful four seasons. 60 dancers will perform in total, in the final section, all of them perform on stage together, which is magnificent and beautiful at the same time. Gion Kobu provides video content, wich will be able to be viewed here. Miyako Odori has three different tickets. 1. Good Seat including Matcha exepriece with Maiko (4500 yen). 2. Good Seat (4000 yen). 3. Standard Seat (2000 yen). Let’s look at the specific differences, for people who reserve option 1 or 2, their seats will be reserved (on the 1st floor or 2nd floor), but not for option 3. For 3, people sit on tatami mats on the third floor. So, the earlier they come, the better spot they can get. For those who prioritize price, 3 seems more appealing. For those who really want to enjoy the experience, 1 is the best, because 1 has the special benefit of a Maiko making a cup of Matcha (powdered green tea) for the customer. They might not speak English, but it will be obviously a highly memorable time. Note that for option 1 people must arrive at the venue at least 40 minutes before the show starts. Tickets are available at the venue, Gion Kobu Kaburenjo. However, it is wise to reserve them beforehand. From overseas, people can apply via e-mail. When making a reservation, choose the date (April 1st – 30th), time (12:30, 14:00, 15:30 or 16:50), and Seat Category (Special Class Ticket with Green Tea (4500 yen), First Class Ticket (4000 yen) or Second Class Ticket 2000 yen). And of course, Name, Attendance day and time, ticket type and Number of person. After that, please follow the procedure which the Miyako Odori organization suggests. However, the easiest way to make a reservation might be to ask the hotel where you will stay to do it, as it is suggested on Miyako Odori’s official website. (Bus isn’t recommended since it is difficult to speculate the arrival time due to traffic). For more useful and fun information which can NOT be found on other guidebooks, please check Kyoto e-Guidebook (Amazon).